With the recent release of Chrome for iOS, I was wondering how do you enable remote debugging for Chrome iOS? Update: With the release of iOS 6, remote debugging can now be done with Safari. This is not the best answer anymore, please follow gregers' advice. You can now use Safari for remote debugging. But it requires iOS 6. As pointed out by Simons answer one need to turn off private browsing to make remote debugging work. The selected answer is only for Safari. 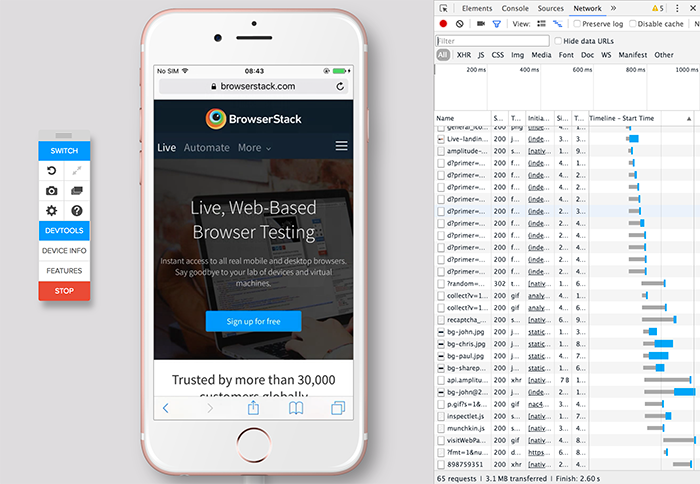 At the moment it's not possible to do real remote debugging in Chrome on iOS, but as with most mobile browsers you can use WeInRe for some simple debugging. It's a bit work to set up, but lets you inspect the DOM, see styling, change DOM and play with the console. 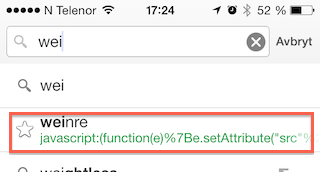 You cannot directly remote debug Chrome on iOS currently. It uses a uiWebView that may act subtly different than Mobile Safari. 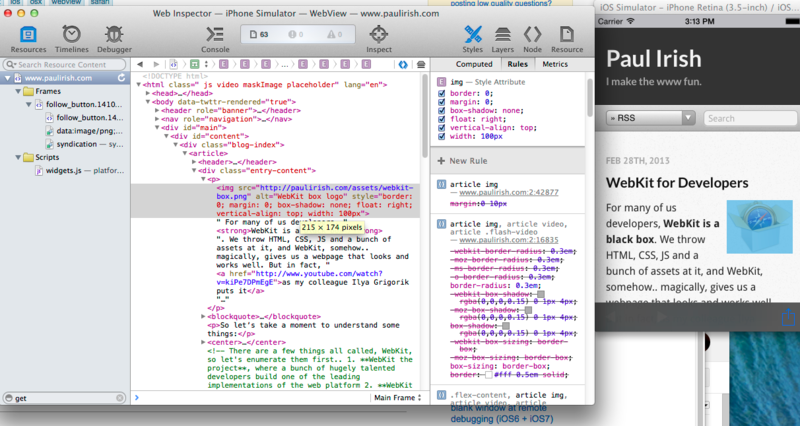 Option 1: Remote-debug Mobile Safari using Safari's inspector. If your issue reproduces in Mobile Safari, this is definitely the best way to go. In fact, going through the iOS simulator is even easier. Option 2: Use Weinre for a slimmed down debugging experience. Weinre doesn't have much features but sometimes it's good enough. 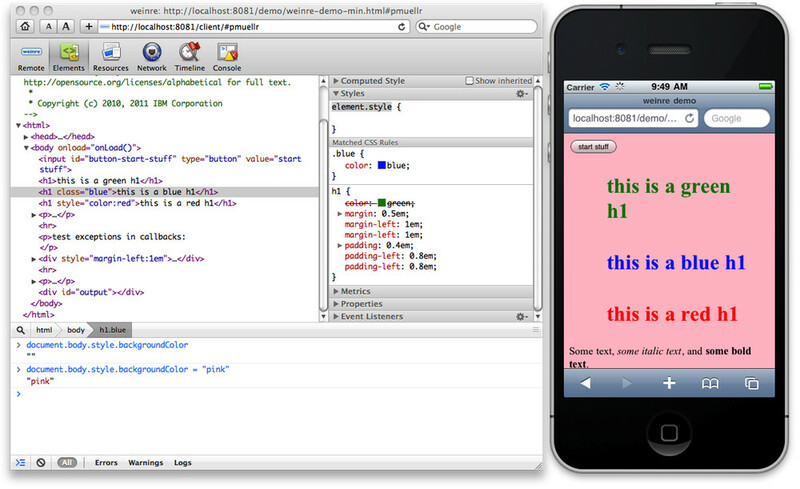 Option 3: Remote debug a proper uiWebView that functions the same. Here's the best way to do this. You'll need to install XCode. Go to github.com/paulirish/iOS-WebView-App and "Download Zip" or clone. Open XCode, open existing project, and choose the project you just downloaded. Open WebViewAppDelegate.m and change the urlString to be the URL you want to test. Run the app in the iOS Simulator. Open Safari, Open the Develop Menu, Choose iOS Simulator and select your webview. Safari Inspector will now be inspecting your uiWebView. From my understanding, Google Chrome utilizes the iOS's UIWebView rather than a full blown implementation of Chrome like the Android counterpart. The problem is that injecting the debugging code is slightly tricky since Chrome doesn't allow you to install bookmarklets. Instead you could open one tab on the page that you would debug, and another on farjs.com and then click "the bookmarklet"
Copy the bookmarklet JS code, get back to the first tab, with the page that should be debugged, and paste the bookmarklet code in the location bar. I recommend Vorlon, works like weinre. I like the UI of Vorlon, and it support SSL, my application is in HTTPS, I tried weinre with ngrok, ghostlab and vorlon, only vorlon works fine. 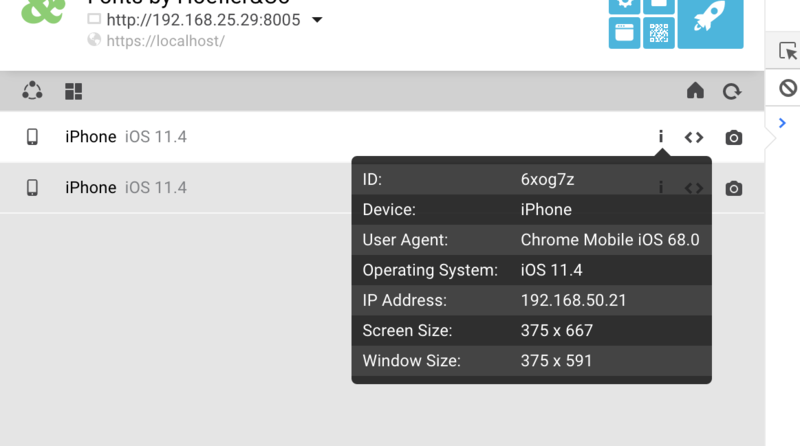 The ios_webkit_debug_proxy (aka iwdp) allows developers to inspect MobileSafari and UIWebViews on real and simulated iOS devices via the Chrome DevTools UI and Chrome Remote Debugging Protocol. 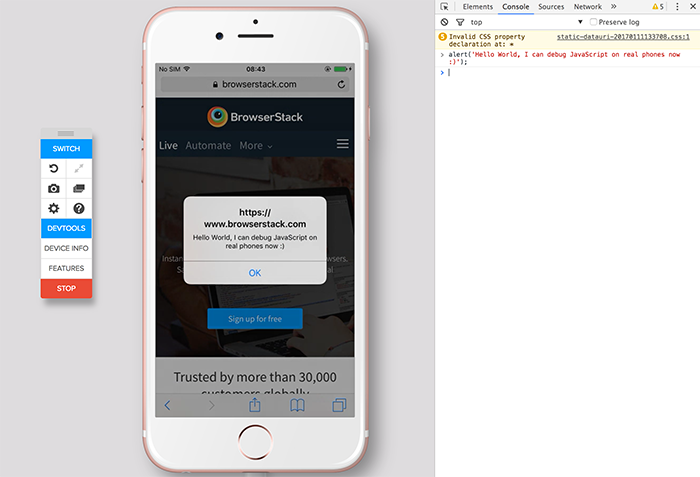 DevTools requests are translated into Apple's Remote Web Inspector service calls. You also need to have 'Private Browsing' turned OFF. 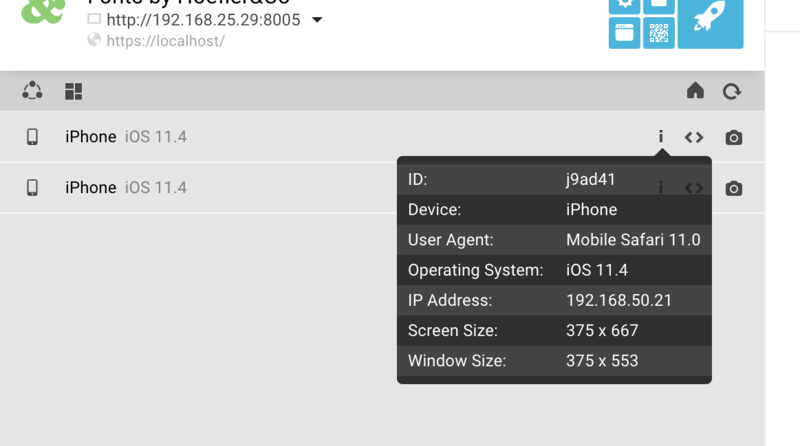 Vorlon.JS is best for remote debugging of iOS or any other client. Also try Adobe Shadow, which allows remote debugging/inspection and Sync. Adobe Edge Inspect (https://creative.adobe.com/products/inspect) is another way to debug all your mobile devices IOS and Android (no Windows Phone though). It uses weinre for remote DOM inspection/changing. It's not the fastest of methods, but it works on Windows. Unfortunately they depend on Apple to open up an API in WKView for this to happen, after which maybe debugging will be available from Safari. I am using remotedebug-ios-webkit-adapter, works well for me with IOS and debugger open in Chrome on Windows 10. Note: I have no affiliation with Ghostlab creators Vanamco whatsoever. It was important to me to be able to debug Chrome-specific problems, so I set out to find something that could help me with that. I ended up happily throwing my money at Ghostlab 3. I can test Chrome and Safari mobile browsers as if I was viewing them on my desktop. It just gives me a LAN address to use for any device I’d like to debug. Each application using that address will appear in the list in Ghostlab. You can trigger DevTools to inspect the webpage opened on the BrowserStacks remote device. I've shared the screens for the same below. Hover over the elements, edit HTML, CSS just like desktop browser devtools work. Support for DevTools on BrowserStack? Client browser needs to be Chrome or Firefox. That means you need to use Chrome or Firefox browser on MacOSX or Windows to use BrowserStack Real Device DevTools. Note: You need to buy a plan to test on all real devices, as a free user, you'll get couple of Real Android devices (includes tablets) and couple of Real iOS devices (includes tablets). Also, emphasizing on the word Real Devices because they provide emulators as well. 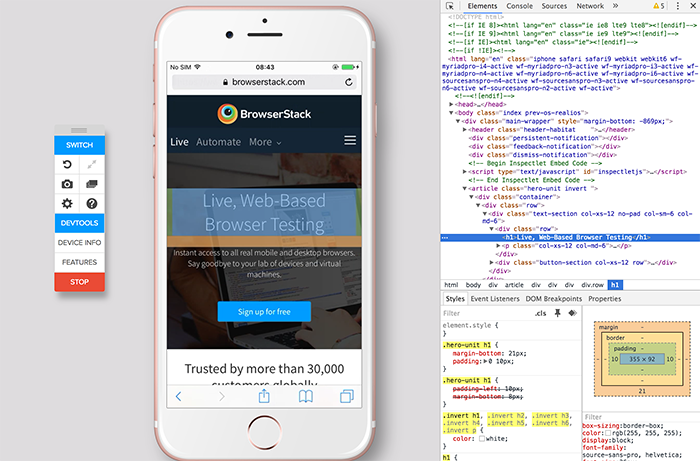 More details on this, please refer to DevTools section on Mobile Features page. Not the answer you're looking for? Browse other questions tagged google-chrome google-chrome-devtools chrome-for-ios or ask your own question. iOS 6 debug console gone? How to open the Chrome Developer Tools in a new window?